I want to believe this is decent. It is obviously only great if you have surge active, but in the proper lists that can be trivial, and 2 mana counters have been seeing less and less play, but it is an uncounterable counter at 2 mana, which seems like it would be very game winning when relevant. Mana Drain is fringe right now, and this would fit into a totally different archetype I think, but this can be an absolute answer to protecting your mentors or Salvagers, or very definitive way to push though your game winner? Maybe more sideboard against control matchup where you know you will be trading spells? For creatures I'd rather use Caverns. For other spells - This doesn't protect your stuff any better than any other counterspell. You FoW or REB my tinker. Or in this case we see how strong Overwhelming denial can be and you Overwhelming denial the tinker. It doesn't push thru game winners. Its defensive and stops them. Good potential. I think we'll see it pop up in some big blue style decks. My mother told me that if I couldn't say anything nice, I shouldn't say anything at all. So, instead of talking about this card, did you know that Flusterstorm, the format's go-to uncounterable counterspell, is now worth like $67.00? We're living in a stupid world, people. Yes, this is an evilly/poorly designed card. 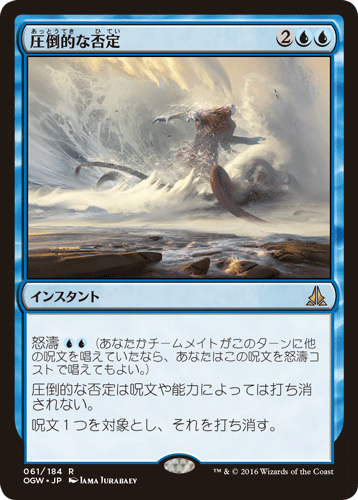 On your turn, when you're likely to have Surge, it is no better than Mana Drain at protecting your threats. On your opponent's turn, when you'd like an uncounterable answer to their threat, you probably don't have surge. At first glance I said "nuts! ", but then Khahan opened my eyes. This card is a less fancy Counterspell when defending own spells, but it's great to cut bombs. It should be awesome with 4 brainstorms, so I expect it to be playable in legacy. In vintage it performs a similar role to mindbreak trap, trying to win counterwars: you play a threat, I play another instant, and the bigger the stack, the better the trap. While trap is free and exiles, hits potentially more than one spell and exiles them, it needs 3 spells to work, which can be a lot. That said, trap is not a common staple but sees some play. Overwhelming should be ok in heavy control lists, such as landstill or monoblue. This is not a crap because it is strictly better than Last Word.But we notice Flusterstorm can do almost all the same job for . While fluster would be better most of the time (specially for the cost), it only hits sorceries and instants, and in late game it can be paid. Against tezz or gifts I often have found myself with a dead fluster in hand , and this new counter would have been alive. However I hardly can play this over drain. I would play 3 or even 4 drains before playing first Overshelming denial. The issue with flusterstorm is your opponent can always flusterstorm in response and now has 1 more leak on the stack than you do. Overwhelming denial serves the same purpose as flusterstorm and mindbreak trap. It does so in a different way. I think it will compete with those 2 cards and find its way into a few decks here and there. As somebody mentioned above - at $67 a pop for flusterstorm if I pull one or two of these in a draft I'll have to consider using it. Seeing as how I am still a fan of mana drain (I love setting up a drain on on a FoW and hard casting memory jar..but then again my record lately is probably reflective of holding onto that old line of thinking!! haha) and still have it in many decks along w/ fluster and/or mindbreak, I should be able to fit this in somewhere.